semi-detached. Focus: We get for you affordable Singapore homes. Rent or Investment. 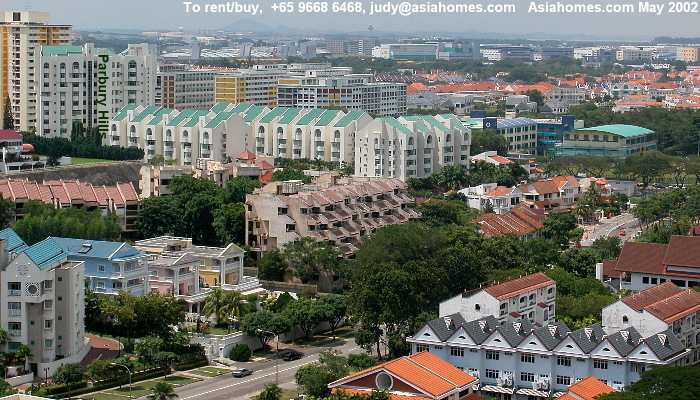 Do you want to buy, rent or sell Singapore properties, apartments, condos, houses? Asiahomes.com can help you. 27, 34, 36 Parbury Avenue, around Upper East Coast Road/Bedok South Ave 3 junction. 182 units. Freehold. Completed: 1997. Living/Dining room - marble tiles. Bedrooms: parquet. Swimming pool, tennis courts, squash courts, gym (4 pieces of equipment), 24-hour security system, covered car park, playground, sauna, fitness area/jogging track. Condo looks good, gives a clean clinical impression. Low density and low-rise (4-storeys) blocks x 5. Only one high-rise block with sea views in higher floors (10th floor above). On top of a low hill but certain blocks face Housing & Development Board apartments (HDB) directly. Some expatriates dislike living next to HDB apartments, but some like the convenience of amenities usually found in HDB estates. A small semi-circular balcony off living room. A big pool yet not crowded since there are only 182 units. Good for expats who fly frequently or work in Tampines offices and Changi Airport as it is relatively near both. It takes around 5 minutes to drive to Changi Airport and around 15 minutes to drive to Suntec City. Marble flooring of living/dining gives it a high class feeling compared to ceramic tiles of Melville Park. A small gate leads to the Tanah Merah subway on the right (more than 15-minute walk passing 7 blocks of building) and provision shops of the HDB estates on the left. Buses to Bedok subway. You can walk from the Main gate downhill in 5 minutes to the Upper East Coast Road where there are buses going downtown to Orchard (No. 10) or Tampines (No. 12). New Cold Storage supermarket 2 bus-stops away. Not near subway and not many taxis in this location, but there are buses which ply regularly at 10-15 minute intervals. Expect >30 minutes by non-express bus to Raffles Place but <10 minutes by bus to Tampines. E-mail judy@asiahomes.com Tel: +65 9668 6468. Subdivisions (condo & house details) has some of the details of the advertised condos. Townerville colonial houses for rent. No condo facilities.